Groundwork residuals that could be used for reconstruction were uncovered from three of the former four gateways in the defensive walls. The PORTA PRAETORIA was particularly rich equipped to function as a representation building, and was oriented towards the side of attack. Width of the building was 29,4 m; the vestibule (front court) was 12 m in depth. The building was reconstructed in 80 AD. The most noticeable part was the half-circle outer vestibule with the towers on either side. From there you would have seen the exterior side of the defensive wall, the outer vestibule and the river Rhine at the same time. The main-street lined by covered walkways run from the gateway directly to the main-entrance of the PRINCIPIA, the camp headquarters. When entering the PORTA PRAETORIA visitors coming from the city of ROME or representatives of friendly sovereigns surveyed, in the far distance, the PRINCIPIA with its impressing façade. The two gateways Porta Principalis Dextra and Porta Principalis Sinistra were located at the two ends of the VIA PRINCIPALIS respectively, the main street of the military camp. Sufficient foundation residuals have been discovered from the PORTA PRINCIPALIS SINISTRA, located in the South West, in order to make a reconstruction The PORTA PRINCIPALIS SINISTRA is the oldest gateway in the military camp, and had been built as a stonework construction in 50 AD provable. Until the camp was liquidated, the gateway had been improved several times. The construction is significantly different from the other gateways. We suppose that this facility consisted of a large entrance-gate only, without having an outer vestibule. Probably one defensive tower had been erected in addition to the stair-tower in order to achieve a better view to the vulnerable outside of the gate. 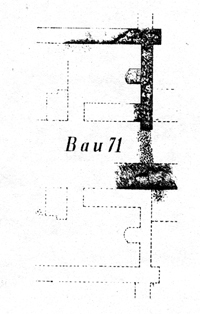 The discovered residuals of the PORTA PRINCIPALIS DEXTRA are very sparse and not sufficient for reconstruction of the building. In spite of this attempts were made to build a halfway credible reconstruction. The excavated fragments point to this gateway not being identical with the construction of the PORTA PRINCIPALIS SINSISTRA, as it was commonly assumed. We suppose that this gateway consisted of an outer vestibule and two towers with rectangular ground plans on each side. 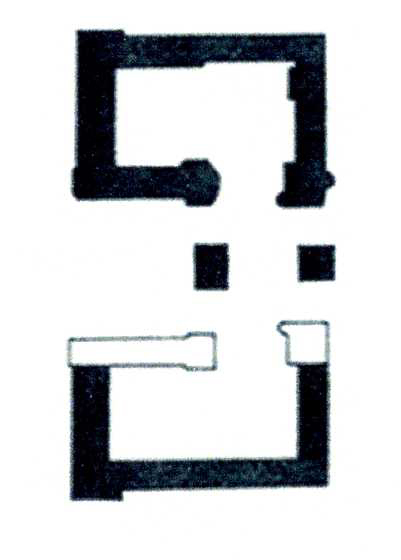 The ground plan corresponds to the typical camp entrance gates built during the time of FLAVIUS. The most decisive features of this type are the outer vestibule including the adjacent side-towers that are not towering off the walls. It can be assumed that this gateway was built during the government of Emperor CLAUDIUS (41 - 54 AD) at the earliest, but not later than during the government of Emperor VESPASIAN (69 - 79 AD). Consequently this building existed until the second stone work phase. * 8.1). The PORTA DECUMANA was the less important one of the four gateways. It was oriented towards the secured and protected hinterland, and had neither representative nor military importance. For the time being, there were only two different types of construction discovered. Residuals of an overlapping half-circle ground foundation lead to the conclusion that the last construction was comparable with the construction of the PORTA PRAETORIA. Main reason for this assumption is the similarity of the buildings, which must have been erected in the timeframe around 80 AD. It is questionable whether the facility got completed towers or not. We can image that two drawn-forth defensive galleries protected the outer vestibule. Presumably there were two unprotected outer staircases for ascending the surrounding walkway on the gallery. Single ground foundations on the left hand side of the inner gate seem to belong to a guardroom, which was located below the walkway.